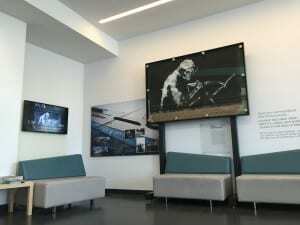 Banksy’s painting of the Grim Reaper has found a new home at M Shed following a long-term loan by the Thekla owners, DHP Family. From Wednesday 3 June 2015, the Grim Reaper will be on display outside the Bristol Life gallery following the decision to remove it from the Thekla. 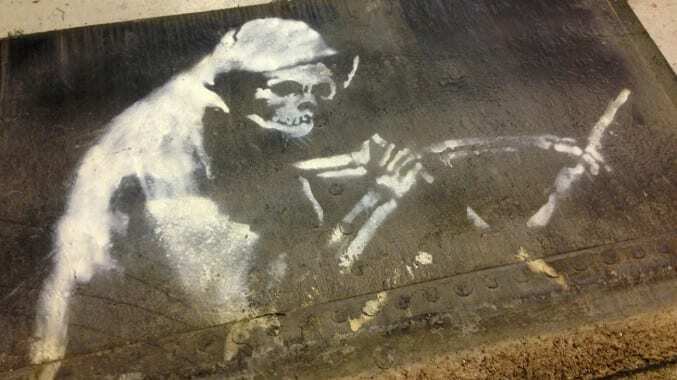 Banksy painted the Grim Reaper onto the ship and nightclub venue around 12 years ago but exposure to the elements was causing ongoing deterioration, with the tag having disappeared completely. While the Thekla was in dry dock in August 2014, DHP Family removed the Grim Reaper from just above the waterline on the ship’s steel hull and arranged to loan the valuable artwork to us on a long term basis. After being cut from the Thekla, the painting was moved to our storage facilities and assessed for conservation. The conservation work was carried out by IFACS on Park Street who helped to investigate what had occurred to the work after being partially submerged in the harbour water. The piece was examined for rust and deposits and the spray-paint was tested so cleaning could be carried out without compromising the image. You can also see Banksy’s Tesco Value Petrol Bomb poster on display at M Shed. 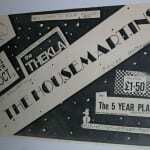 What are your memories of the Thekla? Thekla has been a feature of Bristol’s nightlife since it first appeared in 1984 under the name of the Old Profanity Showboat. During the 1990s the cargo ship played host to a variety of nightclubs. Banksy cemented the Thekla’s reputation as a Bristol landmark when he painted the Grim Reaper onto the side of the ship in 2003. To celebrate the Grim Reaper’s arrival at M Shed, we’re asking for people to tell us about their memories of nights out at the Thekla – find us on Twitter and share your memories and photos. You can also find objects in our collection associated with the Thekla in our online collection search. 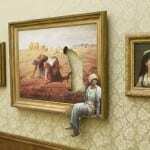 Banksy’s Mobile Lovers was on display at Bristol Museum & Art Gallery from April to August 2014. The work was sold to a private collector with all the proceeds going to benefit Broad Plain Working with Young People (part of Broad Plain Boys’ Club & Riverside Project). Read more about Banksy’s Mobile Lovers. In the summer of 2009 Bristol Museum & Art Gallery was taken over by an extraordinary exhibition of works by the infamous Bristol artist Banksy called Banksy versus Bristol Museum.